Plymothian Transit: Flogging a dead horse? I do wonder how staff working for First Devon & Cornwall must be feeling at the moment. Hot on the heals of Stagecoach Gold attacking the main X80 comes news of another high quality attack on one of their main route corridors. Plymouth Citybus’ announced today that it will launch a prestigious new service between Plymouth and Tavistock from October 5. Plymouth Citybus, a Go-Ahead Group company, has invested £1 million in a new fleet of four high specification Enviro 400 double deck buses, which boast EURO 5 low emissions. 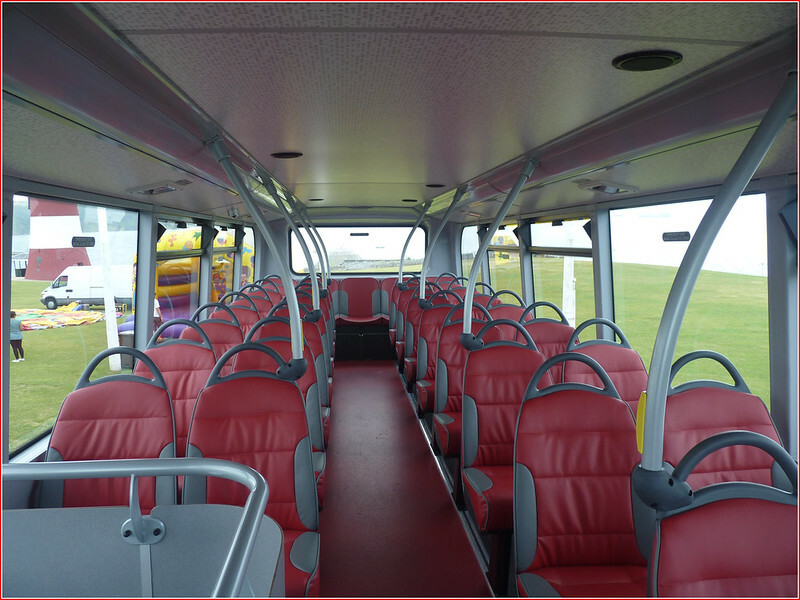 The new buses are thoughtfully designed with additional legroom and incorporate two tone leather seats and free Wi-Fi, enabling passengers to check e-mails, update their status or shop while enjoying the views across Dartmoor. The buses will also be the first Citybus vehicles to be dressed in their new premium brand, which will be unveiled on Saturday September 28, on the Civic Piazza in Plymouth City Centre. The new fast route will operate up to every 30 minutes from Monday to Saturday, between Tavistock and Plymouth, incorporating Yelverton. The new route will also operate on a Sunday, making it a seven day a week offering. Citybus has just seen its customer satisfaction rating from independent group Passenger Focus rise six percent since last summer, alongside being awarded Investor in People status earlier in the year. Plymouth Citybus’ Managing Director Richard Stevens said: “People in Tavistock have requested a Citybus provided service, which we are please to respond to. Knowing that comfort and reliability are the two most important factors on longer bus journeys, the introduction of high specification buses with good quality seats and internet access is a perfect solution”. Further details about the new service will be released towards the end of August, in preparation for the launch on October 5. I assume that the 4 buses mentioned above are part of the initial 8 that have arrived at Milehouse, the first of which was on display on The Hoe on Saturday. This was certainly well equipped to a high standard with very comfortable seats. Cant wait to see what the 'premium brand' will be. The big question we all are waiting to see the answer to – What will First do next? If they want to fight back then they will need some newer buses than they have now. Of course being part of a large national group which does have a stock of high quality double deckers across the fleet could help, assuming First were up for a fight? Or do they try and keep the passengers with a lower fare option with the existing fleet? Not everyone will want to pay more for luxury buses, they just want to get from A to B for the cheapest fare available. They could of course try to attack back on Plymouth Citybus’ strongholds in Plymouth as they have done in the past, although now its against the might of Go Ahead rather than just a local municipal bus company which the council had put on the market. Either way, all eyes will be on First over the coming few weeks for any hint of what they are planning to do. 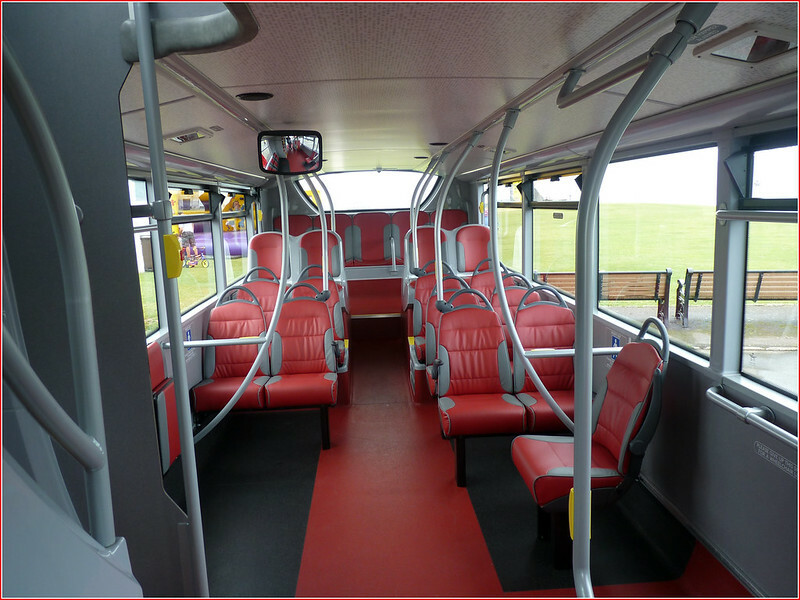 Interesting- that bus appears to have quick release seats on the top deck so that configuration can be changed easily. Not so on lower deck. Do Stagecoach and Citybus know something we don't? I think these 4 deckers Citybus are on about are a separate order. I could be wrong though! Citybus have already won the battle for Ivybridge, however we've not heard that much on the 33/43A to combat First's 4/1/1A, so I assume both are doing okay, and neither are doing especially better than the other. This really will be an interesting battle to watch. I do wish Citybus every success however I do feel a bit for First coming under such strong attacks, both about a week apart from eachother. I would be interested to hear from a PCB 'official' or a driver regarding these two services. The 43A seems to be doing OK, 33/33A seems a bit dead other than Stoke traffic. This has been a disaster for First in Devon this past week. They have seriously got to fight back and quick. I would say lower fares on Tavi route to start in September before Citybus get to start. Increase evening/Sunday to 30 mins or just Sunday if Citybus are not doing evenings which I suspect they won't. After that They need to make some kind of fight in Plymouth, I would suggest a return of the 12 to Plympton, Citybus service here is poor to say the least. Then look at perhaps Whitleigh and Honicknowle again. Also speed up Tavi route by taking Wooolwell out and reinstate old number 7 perhaps as 85 from Plymouth to Woolwell only!! Oh and make it quick!! To be hoest I would let Stagecoach have X80 and concentrate on Plymouth!!! I understand,it is an ADDITIONAL 4 deckers ON TOP OF the 8 we already hve! Tim O'Toole himself has said First were nearing completion of their withdraw from South Devon a few months back, coincident? If Stagecoach and Citybus can both hold their nerve with these two forays then I'm afraid FDC's Plymouth operation looks pretty comprehensively screwed. At least it'll mean the end of First being able to get away with ripping off customers by charging £6.35 for a Tavi Linx return on a filthy, terminally clapped out B6.. I am hoping this will end up as Northampton Part 2. 2 of their remaining out of town routes are under attack by serious heavy weight competitors, the UGO network will probably slowly wither on the vine as Go -Ahead fight back. In reply to an earlier comment, I can't see Stagecoach or anyone else for that matter, being interested in Firsts Plymouth operations, long term they are a 'dead duck'. What merit is there in seeing First disappear? This isn't a fight back by PCB more an onslaught on the profitable elements of Firsts network. I see PCB don't appear interested in Wembury or Crafthole do they. The "UGO-network" is already dead and buried. The MD who introduced it was also responsible for the demise of Firsts' Plymstock services 5/6. It wasn't broken; he was told what would happen if he changed it but he knew better. Net result, Citybus moved in, with the 5/5A over those same routes and are cleaning up. When management screw it up, they get promoted, the front-line staff (Drivers and engineering) just lose their jobs. Plymouth isn't really big enough for two huge bus companies. I do really feel for all the staff at FD&C,the operation really looks on its last legs.The fleet apart from the P&R Enviros really does look very shabby and one step away from the scrapyard.The competition from Citybus and Stagecoach with their fleets there is no comparison,so FD&C would have to completely replace most of their fleet in Plymouth alone. Heard a citybus driver talking this morning to another passenger, The four Tavi buses are in additonal to the 8. With another 8 Double Deckers due in December - A total of 20 new buses. Only trouble is you need First to fight back to make it a bus war. They don't seem capable at the mo!!! It looks like First could be out of Plymouth in a few months sat this rate. Then watch the fares go up and service get cut, then I hope the First bashers will be happy!! Fares are quite low in Plymouth compared to other cities becaiuse of Firsts competition with Citybus. First have 2 options here and that is to roll over and end up being pushed out by early 2014 or fight back, with NEW city routes of their own in citybus areas where customer satisfaction isnt that high..try Plympton, Eggbuckland, Pennycross and Tamerton. If i were First I would register routes on all main Citybus routes one after the other in the next week, try Whitleigh, Southway, Plympton, Honicknowle and Efford to start. By stealing customers of PCB, PCB profits would go down, running more routes for less customers and their appetite for this assault would soon wither I reckon. Come on First play them at their own game!!! Good luck to First and all their staff at Chelson Meadow!!! Let the distant management let the local team run the company with fares that suit and take on these imposing routes on First areas. First have had it to easy for to long, I'm sure many Tavistock residents will welcome the competition and NEW buses. If First do end up exiting Plymouth as a result of these planned incursions by PCB and Stagecoach i think the travelling passenger will suffer in the long run. Yes First have received critism over the years but their presence with 25-30% of the market has always provided an element of competion in the market. If First want out then some kind of sale to Stagecoach would be the best option so that there are 2 major companies in the city. It will also provide some kind of security to the drivers. Stagecoach could then look to build up services in the city. As a group they have probably been the most successful in growing services and increasing profitability. Although First my feel under siege at the moment they should not forget that as far as Tavistock is concerned they will still have double the departures from the city than PCB are offering. Were First to withdraw would Tavistock just be left with a half hourly service? Certainly that is not as good as what they have now. What if Whitchurch is that to be served? or Woolwell? Is this new service to run late into the evening? Totally agree, without First watch Citybus increase fares and cut services. Thet wont provide a bus every 15 mins to Tavi, with services running until gone midnight i can tell you. Villages like Whitchurch etc will be left with nothing, as will Woolwell. I think the people of Tavistock should remember that when it comes to choosing service provider in October!!! Citybus charge nearly £3.50 return for 10 minute journey in parts of plymouth where no competition from First so £6.25 for hour each way from Tavi aint bad!! Citybus will charge more than that if they were on their own out there, I am sure the school bus PCB from Tavi is £6 odd! First still seem to be doing ok on routes with competition from PCB except Ivybridge. First 4 seems to be fairing better than citybus 33, First seem to have upper hand in Saltash and doing ok in Plymstock. Again people of Torpoint dont expect evening services from PCB so remember that in October when it comes to choosing, without First you could end up with nothing after 7pm!!! First should fight back with somr services in plymouth, perhaps to like Plympton and Tamerton and Honicknowle to start, announce them all at once and play PCB at their own game!!! They dont have to steal all PCB customers on these routes but when PCB see their main corridors being erroded for a few extra customers in Tavi and Torpoint bearing in mind the extra operating costs thet may wel think better of it ad retreat! Oh and Stagecoach have tried the X80 before and failed so can be beaten again although stagecoach are a more formidable opposition! Good luck to First and their staff, hope you are around for years to come, your friendly service is a credit to you and your staff! For an annual pass on one of these Services it is in the region of £600-£650 ish. Forget your pass, £6 one way! The very best of luck to First staff; I do really sympathise with you at the moment coming under such strong attacks a couple of days apart! Finally Citybus have the nerve to what I guessed they would do near 7 year ago except the council run bus company never had the nerve! Think back a few years and First DID try to compete with Citybus - Honicknowle, Plympton, Ernesettle all now gone with only the Estover/Derriford service still running. Think back 25 years to the then recently 'privatised' bus companies and the bus war that came about following the strike at Citybus - not at all pleasant. On another note, First retreat from North Devon was created with cheers! Stagecoach has invested heavily in New buses on the flagship routes, not increased fares and in some places vastly improved timetables to the benefit of the travelling public. I reckon Citybus should take over the 93 to Kingsbridge & Dartmouth, reinstate the 92 to Salcombe & Loddiswell and run a service, maybe No.72 to Looe & Polperro. Anyone can run services better than First! The amount of First buses I see broken down across the South West is at an all time high! PCB seem to be having a LOT of breakdowns at the moment - all in Plymouth where everyone can see them too. I'm always amazed how many people still think Buses are operated for the benefit of the passengers. It has nothing to do with it of course: the shareholders pull the strings and it makes no difference whether you are First Group, Go-Ahead, Stagecoach, Arriva etc etc. If it ain't profitable enough it won't happen. First may jiggle about with their fares, but they won't invest in new(er) buses. If Stagecoach take over the X80 and 93 routes, as seems inevitable, how much longer before they are running ALL the out of town routes. They are already in North Devon so watch out Western Greyhound, they will be on the 76 before long. If (? when ) First pull out of Plymouth prepare for a substantial fares hike. Citybus - He has I believe once ran First in Cornwall, in a period they were run into the ground and failed to respond to competition from much smaller Western Greyhound. Since then he ran Stagecoach Devon in a period he instigated another bus war with First on the X80 corridor again..his X45 offering came and went pretty sharish as did the MD there, victory to First with little effort. Now at Citybus he is off again, ok give him Ivybridge but to be fair this was more Firsts own downfall for overlooking Ivybridge for so long! Now he is paying a fortune for new buses that will need to pay for themselves on long established First routes, offering a less frequent alternative to First, which i suspect will see 80%+ of customers stick with First, this will hit profits at Citybus and I am sure Go Ahead will not be pleased with that! First - Tried to sell Devon, Cornwall and Somerest I believe and this never happened. They have brought in Alex Carter to turn it around, why pay his no doubt large consultancy fees purely to close it down, they could do it themselves with the fees! He is already turning Cornwall and Somerset around, I suspect Devon is last because it will be the most work with Competition from Stagecoach and Go Ahead, but he has got a proven track record in this field. I am sure the added competition on X80, 81 and 83/84/86 is the last thing he needed but he has done it before and I am sure he can do it again, esp as First seem to be allowing him to do it his way rather than towing corporate line! Hang on in there First Devon, the way Citybus are going, getting too big for their boots.. they could instigate their own downfall. Go Ahead don't hang around when they ain't making a profit!!! If First Devon needs the most attention and was featuring in their long-term plans, surely it would be tackled with the greatest priority? You wouldn't fiddle with Somerset and Cornwall first because they're 'easier', surely? That would seem to be a suicidal option with SD and PCB on your doorstep, especially with PCB clearly sharpening their claws e.g. Ivybridge. Regarding the X45, this wasn't some isolated pop at First just because Stagecoach felt like it. First brought the competition to Torbay by running open-toppers between Torquay and Paignton in direct competition with Stagecoach's 12. First's buses carried very few people, and I have no doubts that they were only too glad the X45 finished as that gave them a reason to stop wasting money competing on the 12. I don't doubt both companies lost money on that squabble*. First went into competition on the 12 because Stagecoach won tenders in North Devon and started a competitive service up there against First's 1 and 2 to help spread the costs of setting up from scratch. If First hadn't taken their eye of the ball and tried to bump up the tender costs, they wouldn't have let Stagecoach in, in the first place. I don't see what First 'won' as a result of any of this. They ended up closing down their whole North Devon operation, so surely Stagecoach won? * It's different this time. Stagecoach is investing serious money in the Gold operation and running seven days a week. First (rightly or wrongly) has signaled it has no interest in South Devon, so there's an end game in sight. I still don't see how the situation that First finds itself in is anything but their own fault. As for the MD of PCB, surely whatever happened in Cornwall during his tenure was a result of him following orders from Aberdeen, which was basically cut costs and cut costs again. Similarly, expansion at PCB is a direct result of Go-Ahead's decree that it requires a 43% increase in operating profits in the next four years by means of organic growth, high-quality services, innovation, marketing and cost-efficiency (Buses Dec 12 refers). He's only doing his job. Here in Bath First have invested in brand new 13 reg buses on the x39 BAth BRistol route and some new 62 reg buses on local routes in bath. I can only see it going one way in devon as there doesnt seem any investment in new buses down there. PUlling the plug from somerset downwards. So some people think First will stay I seriously think not! Look at Go-Ahead in Brighton and Hove, Go-North East or Go-South Coast strong business' expanding with demand this is what PCB need to do they have kept themselves inside Plymouth for too long. I really hope First do stay, rebrand as Western National and give Go Ahead a fight both outside Plumouth and in the city! PCB and Stagecoach can stop worrying - I hear First Managers have a "plan".